June 26, 2012, 5:34 p.m. The younger you are, the more likely it is that you mainly use a phone to go online. By Adrienne LaFrance @adriennelaf June 26, 2012, 5:34 p.m.
A majority of American adults who have cell phones are now using them to go online, according to a study out today from the Pew Internet & American Life Project. And, within that group, 31 percent of those adults use their phones for the majority of their Internet access. But the numbers get even more striking when you look at younger demographics. Among adults 18-29 who use the Internet on their phones, a remarkable 45 percent do most of their web surfing there. And for all age groups, preferences are shifting away from desktops and laptops and toward mobile devices. 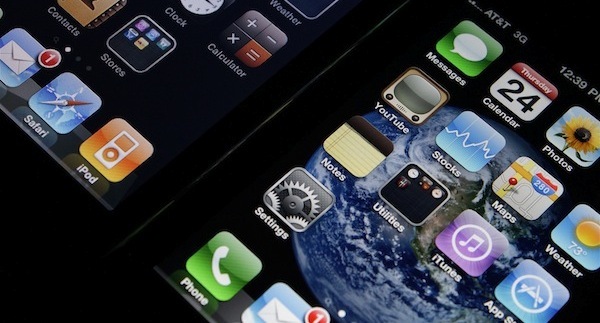 Pew’s most recent data comes from a three-week phone survey of 2,254 adults that concluded in April, but the center first began tracking the percentage of people who use cell phones to go online in April 2009. Smith characterizes the reliance on mobile phones for Internet access as “not only very fast but widespread,” meaning that more people across age and socioeconomic demographics are increasingly using phones to go online. So what kinds of numbers can we expect three years from now? 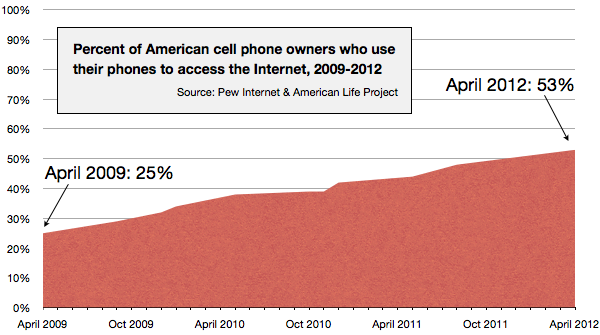 Cell phone ubiquity and more mobile Internet reliance seem clear. Smith says the data from April’s survey came as no surprise but he won’t speculate on what’s to come. “One of the things that we have learned is there could be something that someone is developing in their garage tomorrow that could completely blow any projection we — or anyone else could make — completely out of the water,” he said. Photo by Yutaka Tsutano used under a Creative Commons license. POSTED June 26, 2012, 5:34 p.m.
LaFrance, Adrienne. "New Pew data: There’s a good (and growing) chance you’re reading this on your phone." Nieman Journalism Lab. Nieman Foundation for Journalism at Harvard, 26 Jun. 2012. Web. 24 Apr. 2019. LaFrance, Adrienne. "New Pew data: There’s a good (and growing) chance you’re reading this on your phone." Nieman Journalism Lab. Last modified June 26, 2012. Accessed April 24, 2019. https://www.niemanlab.org/2012/06/new-pew-data-theres-a-good-and-growing-chance-youre-reading-this-on-your-phone/.